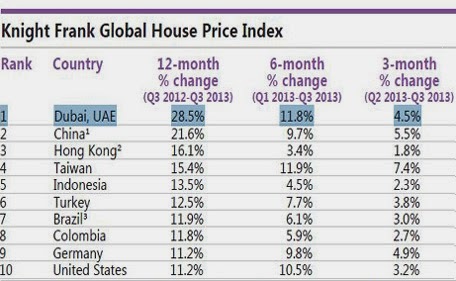 "What we are witnessing in many countries looks like a slow-motion replay of the last housing-market train wreck. And, like last time, the bigger the bubbles become, the nastier the collision with reality will be." 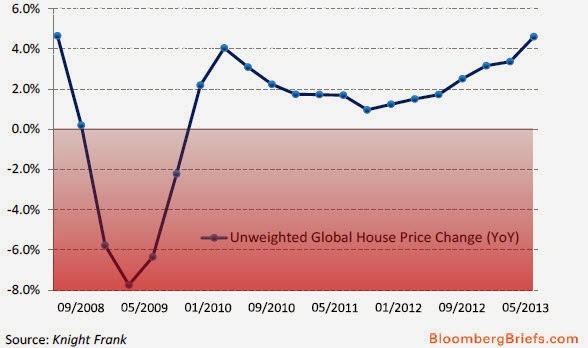 The world property price index has crossed above the record high reached in the third quarter of 2008. This past year, price increases took place all across the world, with only a few major markets experiencing declines. 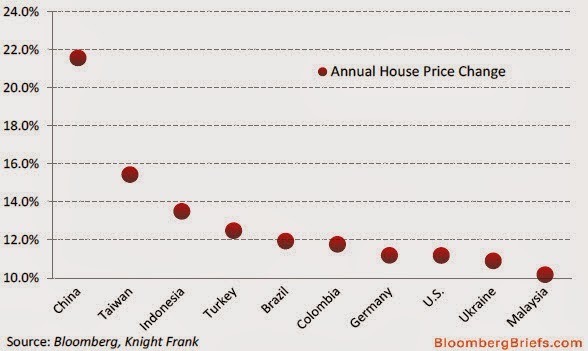 The froth in the global real estate market, as seen previously during the 2000 to 2008 price surge, has been concentrated in the major cities. In Australia the poster city has been Sydney, which has launched to new highs. 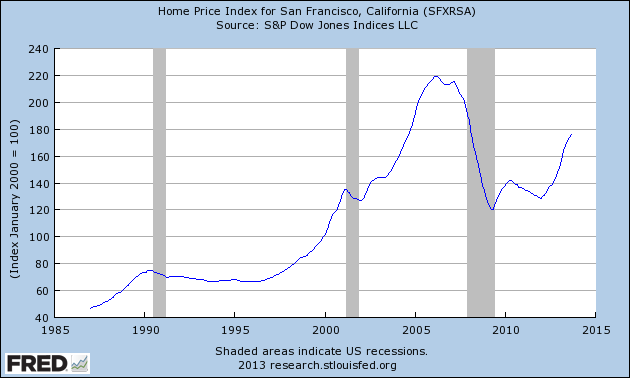 In the U.S., coastal markets like San Francisco are relaunching toward their previous record highs. However, nothing around the world compares to what is taking place in China. Hot money has plowed into Chinese real estate simply to speculate that prices will move higher (many real estate properties purchased just sit empty) in a way that would make the 2005 market in Miami, FL look tame. 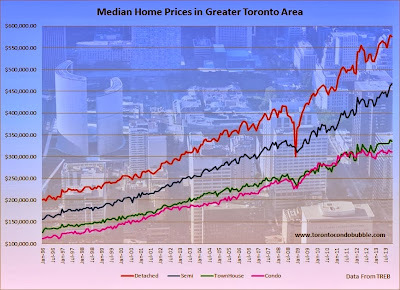 The key metric to follow is the price to income ratio. In many of these major markets, the ratio has moved to unsustainable levels. In Hong Kong it now takes almost 14 years worth of income to purchase a property, which surpasses the ratio seen in 1997 (their last property bubble peak). Prices fell 65% from that point in 1997, with the price to income ratio falling to only 6 years and creating an amazing buying opportunity. Hong Kong is pegged to the U.S. dollar, so the interest rates are virtually zero. You can receive a mortgage in the 2 to 3 percent range, but here is the most crucial point: they are adjustable rate mortgages. 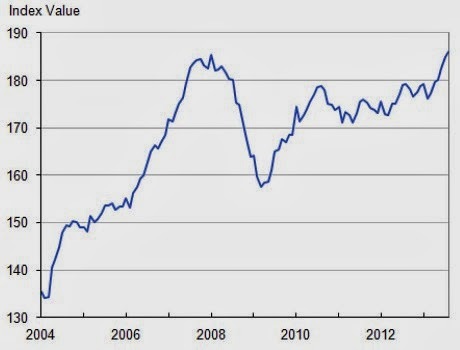 When interest rates reset, it will be catastrophic for their property market. The Fed, Bank of Japan and Bank of England are pumping printed currency into the global economy at a staggering rate. Hot money is chasing property in the same exact speculative way it did in the first part of this millennium. Major cities such as Sydney, Toronto, Shanghai, Dubai, London and San Francisco are experiencing the greatest benefit of this hot money. The story will end the same. 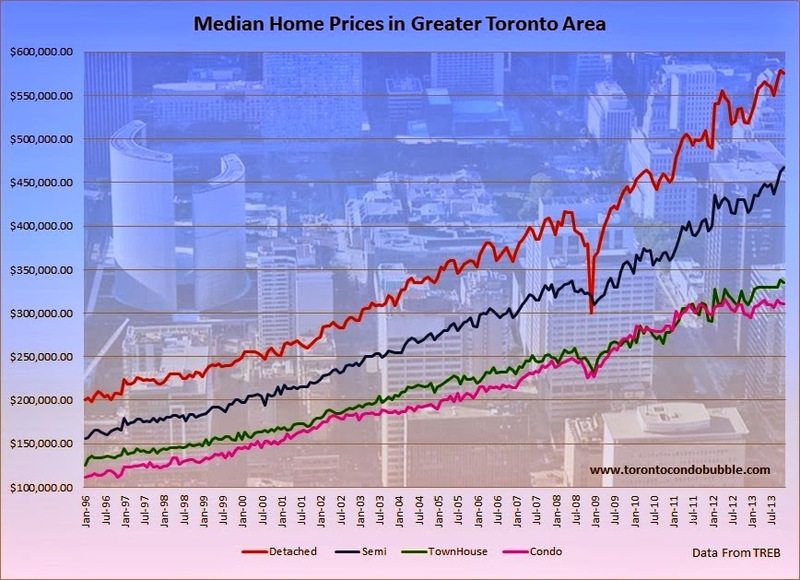 If you live in a major city around the world, I would suggest taking a hard look at the price to income levels in your region before making a decision to buy, sell or hold. With home prices now at new record highs in the U.K., residents are being forced to move into shipping containers. 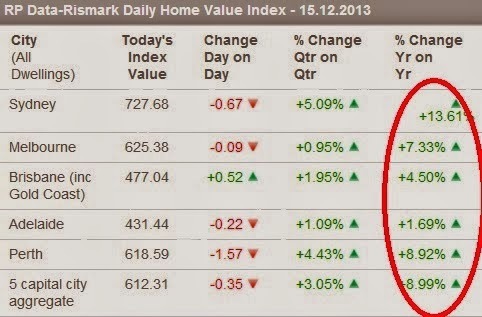 Real estate business improve day by day. Now it's become very changeling. You should improve your marketing system you will success in your business. This real estate foreclosure auctions is also a great company.